I signed up for the Chickamauga Battlefield Marathon !!! I did it, I signed up for the Chickamauga Battlefield Marathon! I am psyched, it's Sat nov 10, so I got time to train. More to come, but here are some details pulled from Active.com site. 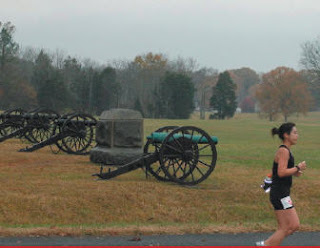 The Chickamauga Battlefield Marathon has been run for over 30 years through the Chickamauga & Chattanooga National Military Park which honors one of the Civil War's most important battles. The race is organized and sponsored by the Chattanooga Track Club. The Battlefiled is 20 minutes south of Chattanooga Tennessee - a city internationally recognized for it's revitalized waterfront and outdoor activities. The USAT&F (GA06019WC) certified paved course is challenging but not extraordinarily difficult. Numerous runners have qualified for the Boston Marathon on this course. Results will be provided to the Boston Athletic Assoc. Approximately 23 miles of the double loop portion of the course winds through the historic military park. Traffic is usually light in the park. Sentries will be posted at each major turn and all turns will be marked. Each mile and the half marathon point will be marked. RBK Peachtree Prep Run/Walk This Weekend!! One of our favorite annual traditions - - the Peachtree Prep Run/Walk - - returns this weekend to Big Peach Running Co. (at our Atlanta location)! And with the help of Reebok ("Official Outfitter of the Peachtree Road Race"), it is, indeed, bigger than ever! For those of you who have not joined us previously, this is the perfect final tune-up for everyone who is toeing the line for the Peachtree Road Race. In fact, the distance of the Peachtree Prep Run/Walk will guarantee your readiness as it is exactly one (1) mile longer than the 10k trek on July Fourth. It also promises to be an enjoyable morning for those who won't be able to participate in this year's race but want to say they've done the distance and the course. Accompanying the run/walk itself will also be this year's installment of the Peachtree Trivia For Prizes contest. The bounty for this year's star trivia performers will include RBK Gear and BPRC gift cards (up to $100.00)! Interested? Of course, you are... this is the world's largest 10k we're talking about! Here are the details:7:00 a.m. - - Arrivals; Meet & Greet with our Celebrity Escorts, Mary Cullen and Kim Smith (more below)7:15 a.m. - - PRR Primer and Peachtree Trivia For Prizes contest begins7:45 a.m. - - Peachtree Prep Run/Walk departure9:15 a.m. - - Return To Store; Q & A/Autograph Session with Mary Cullen and Kim SmithFor the run/walk we will have water coolers and energy gels available along the route. The total distance is 7.2 miles, from Cherokee Plaza to Piedmont Park. As part of the warm-up for race day, we're advocating everyone take MARTA back to the store afterwards (from the Midtown Station). Please plan on bringing your Breeze card or the fare necessary to purchase your card (and the rides necessary to get you home from PRR less than 2 short weeks later!). BPRC-Atlanta is located less than 1/2 mile from the Brookhaven/Oglethorpe University transit station. In addition, THE FIRST 100 PERSONS TO REGISTER WILL RECEIVE A FREE REEBOK NALGENE BOTTLE and AUTOGRAPHED LOGBOOK! The race began at the Georgia Convention Center just off Camp Creek rd. It was nice to have the amenities, free parking, and many bathrooms, plenty of room to stretch out. The start: Being that we are all proud American we sang the Star Spangled Banner. The wheel chair division started first, we had one participant start the 10K race, and unfortunately he flatted out and had to come back to the start. I wish I had my bike kit. Moments latter the rest of the 10K bunch took off, and being that this is the “Army Hooah Race” many of the racers were “Army men” and “Army woman”, and they were fast. The rest of the race went fine, they had water stops every mile and I was glad to see them, as it was hot. The course was somewhat boring, it was a point to point all taking place on one strait road, and somehow all up hill (My Dads school must have been around here somewhere, I mean it was all up hill both ways). They had blocked off many roads and all intersections were manned my Police officers, so all you had to do was run. At one point somewhere around mile 4, the Fire Department had set up a ladder/basket truck up with the basket over the middle of the road and showering us runners as we pasted by. The miles went by quickly and I felt good the whole way, I did start to slow a bit the last mile or so but I had a good finish. Post race was cool, they had set up in a large lawn area, they had an Apache helicopter, the Army Humvees and bunches of things to see and do. The also had a Tot Trot 50 and 100 yard dash for the little ones. I would/will run this one again and I would recommend it to every one. I felt quit proud to run with the Men and Woman of our fine Army, and the hair on the back of my neck stood up when I entered to the finish area at Fort McPherson. And thanks to all the Volunteers! The 6th annual Army HOOAH Race is comprised of a 5K, 5K Nordic Pole Walk/Race and 10K. I am going to run the 10K as warm-up for the Peach Tree Road Race July 4th. I was just checking out some of he pictures from last years race and it looks real good. The race ends at Hedekin Field, in Fort McPherson and it looks like they open part of the base to racers and families for post activities and a tot trot 50 and 100 meter race. Click here to check out the race. HOOAH! Old Colony YMCA Triathlon - O N E M I L E swim! I am going back to Massachusetts for a visit, and while we are up, I want to race a TRI in the town I lived in for 5 years. Its going to be nice to come back home and race, I haven’t been back since last November. So the race is an Olympic/International distance, and I have now starting to train for it. O N E M I L E, it sounds so long, and I got to get better in open water swims. Swim: A triangular course. Water Temp is expected to be in the mid 70's. Wetsuits will be allowed. Bike: A multiloop flat course. You leave Camp Yomechas, turn right onto Rte 28, right onto Tispaquin Rd, right onto Thomas, right onto Chestnut, right onto Purchase right onto Rte 28. Do this 4 times, then head back to transition. 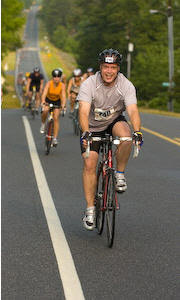 Run: The run is one loop of the bike course in the opposite direction. Last year just over 300 racers completed the race. And it looks like firm-racing puts on a good race. I know the area well, the race is 4 miles from our old house. 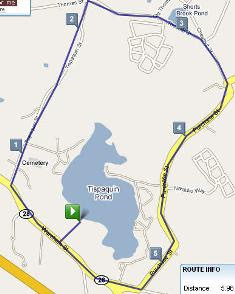 During some of my long runs I would run part of this bike/run loop, as I remember the hills were not too high. So that’s it for all, I got to go get some laps in. The race was great, both a half and sprint were run at the same time, starting in waves. Between both races I would say a total racer count was somewhere around 500-600. Lots of cool rides and some pretty sick people. I set a goal of under two hours, and I made it in 01:57:47, butI got a penalty of 02:00, for some reason unknown so my time is 01:59:47. Well, I think I got it on the bike, just before the top of a hill, I got passed on the left and the passing ride and I were talking while we got to the top, maybe 10-20 seconds, then a motorcycle pulled up and I saw the passenger writing down our numbers, and I thought to my self this it isn’t good, then I thought they are just checking too see if we were on the correct loop, as the half course broke out ½ mile back. So I sent an email asking why I got popped, and I am waiting. The swim was big (750m), I mean, the laps in the pool helped but swimming in a dark lake with the blender going was awesome! I thought I was going to die, kidding (a little), I had been swimming 1000 or more meters for 5 times a week for a few weeks, so I knew I could go the distance, but excitement of the lake and no lines to follow, and the fact I just couldn't take a break was daunting. I think I could of swam a bit faster but I didn’t want to blowup so early, but once out of the water I had to run a 300 yard or more to get to the mat in front of the transition area, so that added some time to the swim. I got to business in T1, I was moving a good pace, but I need to recover a bit from the swim. I had everything laid out, I brought a 5 gallon bucket to wash off the sand off my feet, then I flipped it over and sat on it to put on my shoes (and had my sox rolled and powdered), grabbed the rest of the bike stuff, and ran 100 meters to mat and then to the mount line. I had taped a couple of gels to the top tube, one for the ride and one for mile 13 so I would have something for the run, the same time I was drinking Gatorade. The combo was a bit too sweet, and next time I might cut the Gatorade with water, and one gel would be enough, but that’s how you learn. The bike course was all hills, Georgia is very hilly, and it kicks my but, I got to drop a few, and get it some long rides. But I finished the bike, got into T2, and took my time stowed the bike and put on the sneaks, and out I ran, I was pretty tired by the run, and the course was a out and back, all up hill out and down was nice. By the end of the run it was 84 degrees out and I was hot and spent. Well I have decided to participate in the Coliseum Rock n’ Roll Man Triathlon sprint triathlon this Sunday June 3rd, and I am psyched. I have been training hard, and I am looking forward to putting it to the test. Coliseum Health System's is sponsoring two race events a sprint and a half Iron, to benefit the Ronald McDonald House of Macon. The sprint is full size, the swim is 750 meters, the bike is 15 miles and the run is the standard 5k.